We would just like to thank all the people that made Micklefest so successful yesterday. Firstly a huge thank you to Jeremy (and Maggie) from Academy Audio (http://www.academyaudio.co.uk/) for sorting the PA requirements and to our fabulous sound guy Anis who made sure the whole event ran smoothly. 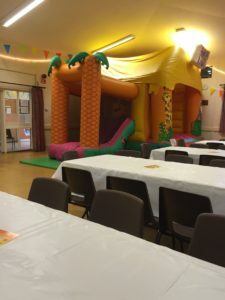 Thank you to Jump & Bounce (https://www.jumpandbounce.co.uk/) for supplying the MASSIVE bouncy castle for the day! Thank you to our 3 AMAZING acts (live feeds from all available on our facebook page) Martin Holland Re-Play (https://www.facebook.com/ColdPlaytributeact/?fref=ts), 6to9 and Mandolin Monday (http://www.mandolinmonday.com/). Thank you to Dave Day & Andrew Stevens for getting up so early to help set up the hall (thanks to the great British weather!) and to all the committee members that worked on the BBQ, behind the bar, selling raffle tickets etc. Without everybody pulling together we couldn’t make this event happen. AND FINALLY….THANK YOU to everybody that turned up to support Micklefest 2016, it really does mean a lot to us. The money raised goes back into improving our community centre for the local residents. Already looking forward to a bigger and better (and hopefully outside) MICKLEFEST 2017 on Sunday 27th August! Put it in your diary today!! !